The tarsal tunnel is a small passageway found inside the ankle, connected by soft tissue and bone. The tibial nerve runs through the tarsal tunnel, as do other tendons and blood vessels. Tarsal tunnel syndrome is a rare condition that is caused by damage to the tibial nerve of the branches of the tibial nerve. This damage is often caused by compression as the nerve passes through the tarsal tunnel. If you are experiencing one or more of the symptoms noted above, then you should pay a visit to your health care professional as soon as possible. If the condition is left untreated, it can result in irreversible nerve damage. This makes it imperative for your health care professional to be allowed the opportunity to properly assess you and your condition, so as to initiate the correct treatment program. Proper diagnosis is essential to determine the severity of condition. Once proper diagnosis has been established, the proper treatment can be instilled. Applying a cold substance, such as ice, to the affected area help to reduce inflammation. This should be applied immediately after you condition has been aggravated. Hold the ice on the affected area for ten to fifteen minutes, every two to three hours. This involves lying on a couch with your feet hanging just over the edge. 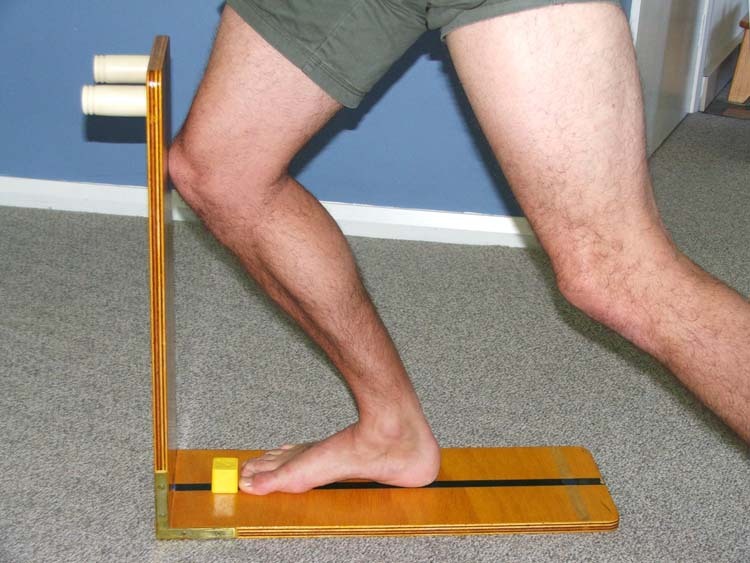 Gentle pressure is applied to the foot to text the flexibility of the calf muscles, gastrocnemius and soleus. A good stretch for the gastrocnemius that can be done by anyone involves standing whilst facing a wall, with both feet flat on the floor. Bend one knee and stretch one leg back, whilst keeping your feet on the ground and your leg straight. Hold for ten seconds and repeat three to four times a day, gradually increasing the holding time. To perform a soleus stretch, bend your knee and lean forward whilst pressing your heel into the ground until a stretch is felt. If you feel little to no resistance, try lifting your toes off of the ground by placing a small object beneath them. This stretch is performed sitting; bend your knee slightly and pull the big toe and forefoot upwards, toward you. Hold for about thirty seconds, and repeat the stretch five times. Try to perform the stretch around three times a day. This involves a person applying pressure on the ankle, you can also use a table leg or chair to achieve the desired pressure. You must then move your foot inwards and against the resistance, holding for ten seconds. Attach one end of a resistance band to a fixed point and the other around your foot. Move your foot inwards and against the band. Slowly return your foot to resting position and repeat around ten to twenty times. This exercise requires another person to be performed. They must applied pressure to the foot, attempting to push the foot into pronation, as you resist the compression. This exercise involves walking with your heel pressed against the floor and your toes pointing up, then rolling the foot forward onto the toes. This can be varied by only walking on your heels, or walking only on your toes. If necessary, nonsteroidal anti-inflammatory medicines, such as ibuprofen or aspirin, are often recommended. If other treatments have not been successful in treating tarsal tunnel syndrome, and symptoms are seriously hindering a patient’s life, then surgery will often be offered. This surgery will most likely involve exploration of the tarsal tunnel, and decompression of the affected tibial nerve. As the nerve takes an extended period of time to heal after the surgical procedure, recovery time can range from three months to eighteen. The success of the surgery is not always guaranteed, and depends upon numerous factors, including the nature of the condition, and the damage sustained before surgery was applied.